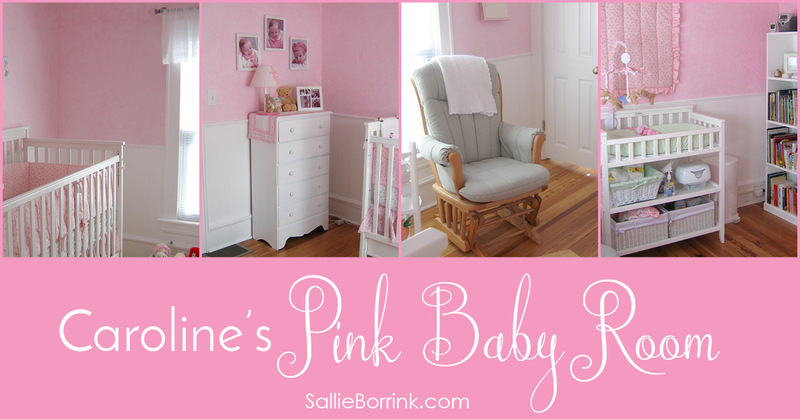 I thought it would be fun to bring back some older posts related to baby things including Caroline’s pink baby room. I took them off my site at one point because they didn’t fit the “niche” I was supposed to develop. I’ve decided I don’t really care and am happy to share this post about Caroline’s nursery. I originally wrote this when she was five and a half months old in March 2007. I’ve edited it slightly, but it is mostly original as are the comments. I hope readers who weren’t around in 2007 enjoy seeing these photos from that happy time when we were finally blessed with a child after many years of waiting and praying. Yesterday Katy left a comment with the following questions. How do you feel about all of this “infant stimulation” stuff? I keep reading that your baby’s nursery should be all in bright stimulating colors (I thought that room was for sleeping. ), and that they need these stimulation toys and videos (like Baby Einstein). What does Caroline play with? How do you keep her environment? 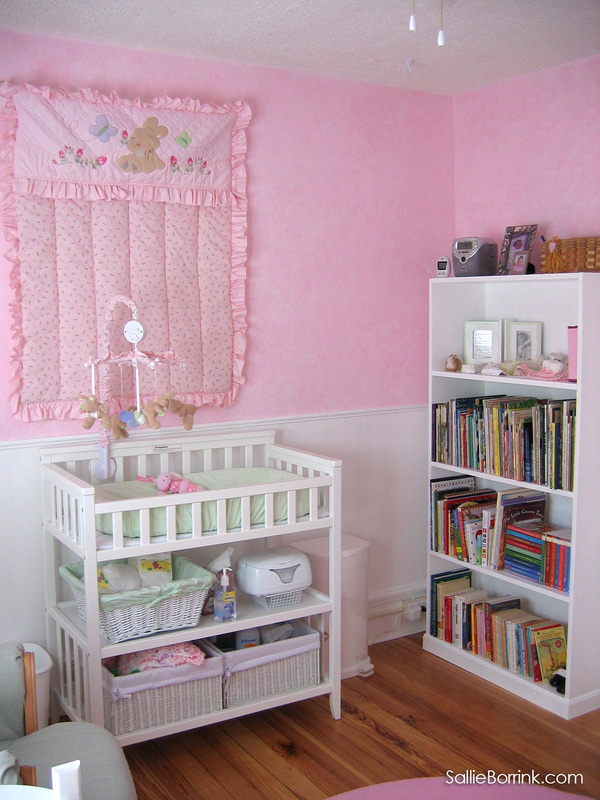 Katie’s questions spurred me on to finally take pictures of Caroline’s room and post them. I’ve been meaning to do a post about decorating her room so I’ll combine the two. Caroline’s room is what was previously David’s office. We had already refinished the original wood floors and had painted all the trim, put in new windows, etc. All we had to do to make it a baby’s room was change the walls and other decorating items. When we were looking for nursery decor, I knew that it was going to be all girl! I was interested in pink in some form. I looked around a long time and finally ordered bedding I found online. It came and I didn’t like it. I wanted something soothing, but this was washed out looking so I returned it. We kept looking and finally found something we really liked at Babies ‘R Us. I didn’t necessarily want something cutesy, but ended up with bunnies and rose buds. And we love it. Since Caroline is too young to sleep with a blanket, we used the quilt as a wall hanging. It was our intention to look for a used crib and changing table that we could paint. Money was squeaky tight at that time and that was all we could afford. My parents graciously gave us money for a crib, mattress, and changing table so we were able to find something nice and new at Target. I didn’t specifically look for a crib with a drawer underneath, but I love it! My mom suggested that we put white beadboard on the bottom of the walls and we were so pleased with how that turned out. The pink walls are two colors. We painted on a base coat and then ragged on another pink color with cheesecloth. It far exceeded my expectations. It is beautiful and we were tickled pink (!) when it was done. We already had a very nice Dutailier glider in David’s office (that we had purchased at an upscale baby store). We simply bought new light green cushions for it (and sold the medium-dark denim ones, which were like new, on eBay). The heart-shaped wooden stand next to the glider was one we already had. It was stained a light oak color and I painted it white. I wanted a bookcase in her room so we asked David’s father (who is an incredible craftsman) if he had any extra wood we could use for a bookcase. Our intention was to paint it so we weren’t worried about whether it was super fine wood. He had plenty of wood that would work. The dresser is also one we already had. It was my grandmother’s and I had stripped and refinished it years ago. It had a lovely oak finish and I cringed a bit when I put white paint on it. I remembered all those hot hours I spent stripping, sanding, staining, and sealing it! But it was just right for Caroline’s room so it was painted. I really wanted to put glass knobs on it, but in the end just spray painted the knobs I already had on there. So that’s most of the room! We also put in a new light fixture/ceiling fan from Lowe’s. The curtains and rod are from Target. The green sign and the white baskets with green and white checked liners were from Babies ‘R Us. My mom bought the rug from J.C. Penney. The wooden letters above Caroline’s bed were purchased at Michael’s and then spray painted white. So all in all it was a fairly low cost room. We were able to use many things we already had and then supplement them with some things we purchased and other items that were gifted to us. So, to get back to Katy’s question, I think a bedroom should be soft and peaceful whether it is for an adult or a child. I can’t for the life of me figure out why a child’s room should be stimulating. I agree that a child’s room is primarily a place to sleep. Yes, they might play in there too but they can play in a peaceful room and be stimulated by the toys rather than the decor. I’ll have to tackle the question of what toys we use in another post. 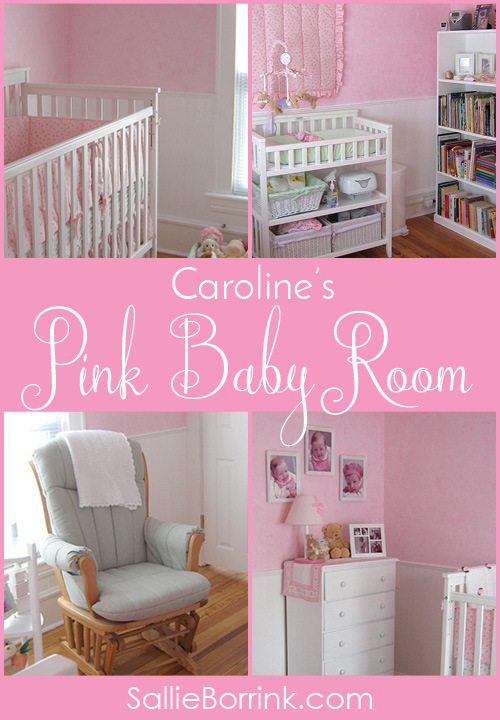 I hope you enjoyed this little tour of Caroline’s pink baby room! Thank you so much for sharing your pictures! 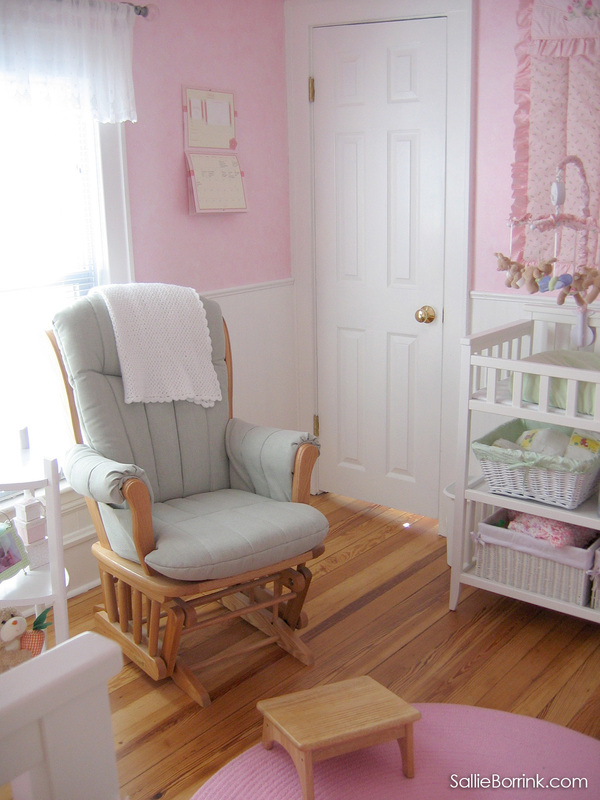 I love little Caroline’s room…fit for a princess and very soothing. Ooh, how sweet! I’ve been wanting to do some painting for so long… maybe your nursery will give me the encouragement I need to get started. Your room looks so nice and fresh. Hee hee. I am never never gonna post pictures of Daniel’s room now! I did nothing to it! Ideally there is a lot I would like to do but there you go! Well…..obviously I put some baby furniture into it and a few pictures on the wall but that was all. We will have to re-think things wiht baby number 2 as they will share a room. I totally agree that a bed room should be a soothing place, not full of stuff and computers and books upon books…….ooops! wasn’t meant to be describing my bedroom was I! Daniel likes to have a book and a cuddly toy in bed with him which works for me because they sometimes keep him entertained for an extra 1/2 hour…..bliss! A beautiful room for a beautiful baby! My little girl’s room is pastel pink and I can’t imagine it any other way. So peaceful and feminine! Thank you for sharing your pictures. Thank you for sharin gpictures–what a beautiful nursery! This is just how a little girl’s room should look! I’m a big fan of pink and an even bigger fan of femininity! My 6yo and 4yo share a room and it is pastel pink and pastel yellow with white furniture. It is girly, peaceful and soothing place to be…well when they keep it picked up! 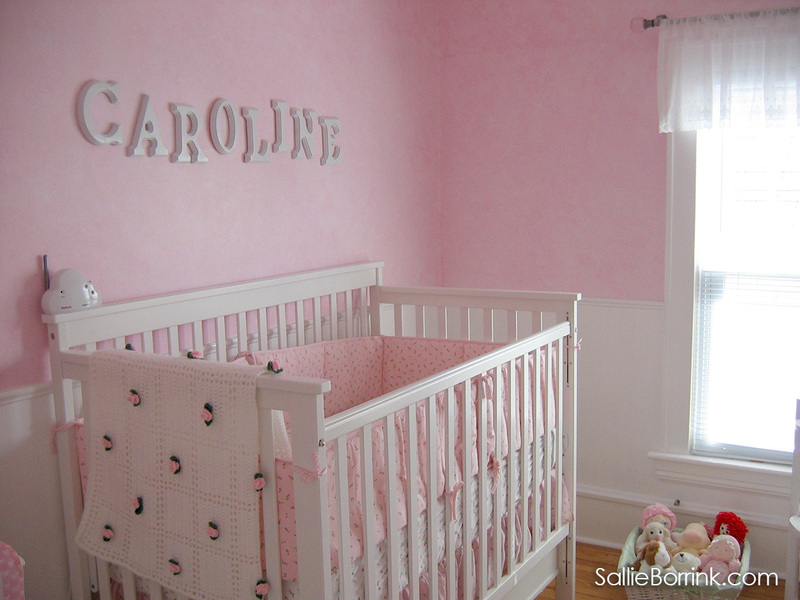 You did a GREAT job with Caroline’s room – it is beautiful! What a beautiful room for a beautiful little girl. I don’t buy into all that stimulation jazz myself. If you sing to your baby, read stories, talk to them, and just LOVE them, they’re gonna be just fine. There are enough parents out there who can pop in a video and never interact with their kids. Which is better? Love. This is such a beautiful, girly room! You guys did so many things to make it special for Caroline. Lovely! Selena’s room is peach and lavender with a little sage green. I am not a fan of the bright colors, either. What a beautiful room! 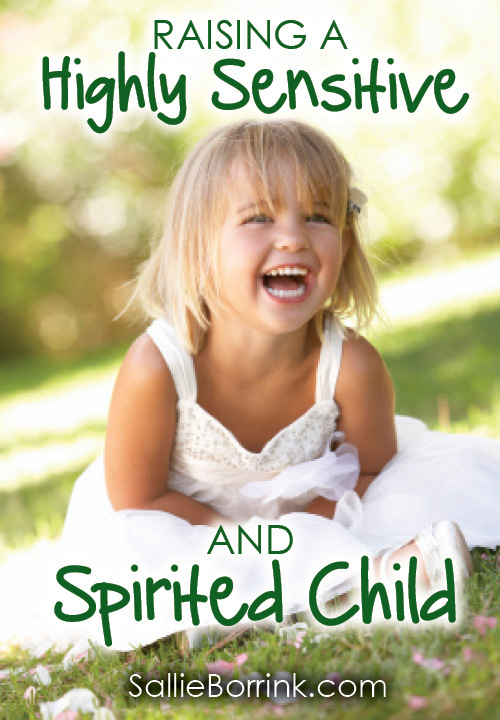 Caroline is a very blessed little girl! oh! her room is so pretty! 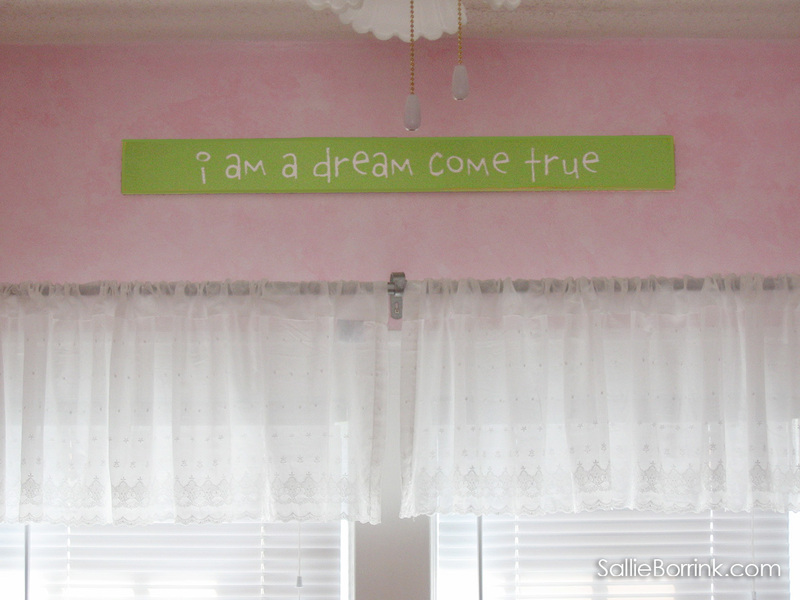 What a beautiful room for a very special little girl. That is such a pretty nursery. Thank you for sharing it with us! This is so sweet, Sallie! Caroline is so fortunate to have such thoughtful and loving parents. Next time you think you’re not doing a great job as a mother you should look at her lovely nursery! Simply lovely! I’m sure this is a soothing place for her to rest. Last comments were 2007 ?? But anyway , thank you for this , because mine are 20 , and 22 now , and those years of babyhood are far away , your pictures reminded me of their yellow “sponged” walls and soft yellow blue and pink Peter Rabbit bedding , pictures , and books, it is such JOY to finally have a baby ( even if I was a very tired 40 year old Mom LOL ) . It is a blessing that you took pictures ! Like I said, I took this post down a number of years ago so there was no chance for anyone to comment. I have hundreds of posts that I’ve taken down over the years. I decided to bring some of them back and republish them. I think if I had seen the pretty soft pink with the white bead board there would NOT have been a yellow Peter Rabbit room at my house ! 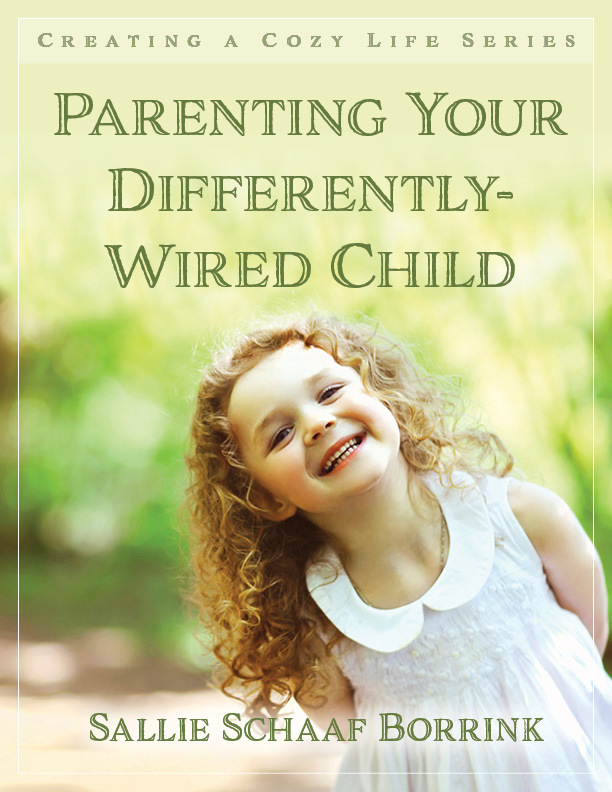 Also – the Older Mom thing , although I have had a few uncomfortable moments such as being called “grandma” by the Kindergarten teacher ! And now being Older than my daughter’s fiance’s Grandmother !!! LOL , you will be pleased to know that my children ( and a few of their friends who also had older Moms ) are very vocal about the fact that they received a better up bringing , more interesting childhood, and see the world in a more reasonable way than their friends raised by younger Moms !!! This means so much to me, because they were NOT so thrilled thru their teen years about being raised differently ! LOL ! What a beautiful room. Caroline is one lucky girl. Pink is my favorite color. That is precious! I know all too well the joy of welcoming a baby after many years of waiting and praying.